WIW: odd colors	WIW: for a heat wave! I like 1 a lot - looks warm and cozy! And 2 looks like a perfect take on 4! I definitely prefer 6 to 5. The red booties are seriously awesome - and I'm also curious to see outfit 6 with the shoes from 5. Do you have another touch of red? (Jewelry, maybe?) I think that might also be fun! I don't know, Amiable, I bought a chambray shirt at Gap recently that had very deliberate fading on it much like yours does. Are you certain it's a reject? And what do the black boots look like from the side? Yeah, the camera pics have really saved me from some fashion disasters. Funny how you can't see it in the mirror but you can in the pic. I like #1 & #2 and I think the boots are worth keeping with a polish up. I think that a lot of the new denim shirts are coming with that fading in the front. I thought it was weird at 1st but then my eye adjusted. You might consider keeping it. Well hey - if denim shirts with that type of fading are coming back, I just might keep it and try it out this Spring. It's too short for pants, I think, so it'll be a summer skirts and capris shirt. and Sarah A - previously worn shoes are usually 6-8 hour shoes for me. 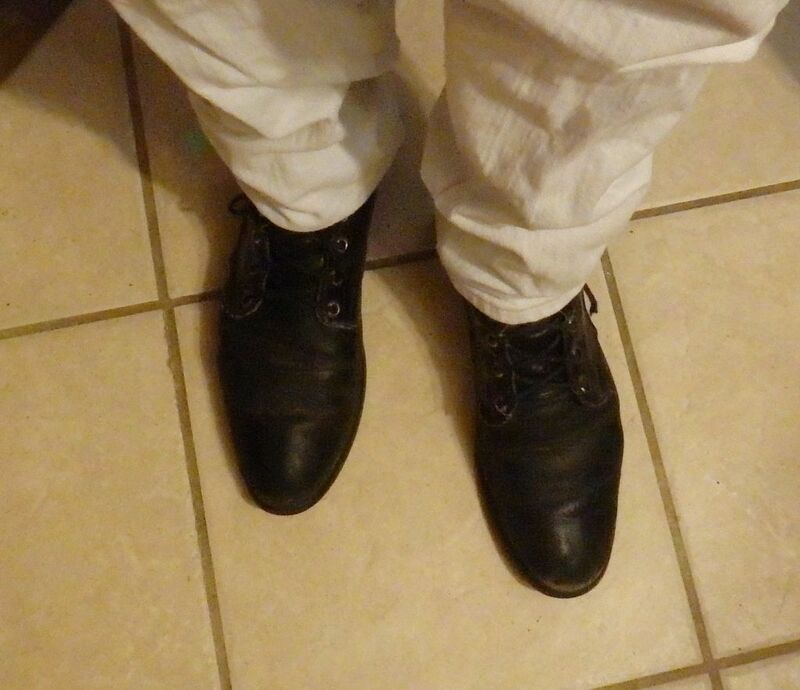 I can't wear them for conferences where I'll be on my feet for 16 hours a day, but otherwise, they work okay for me. All but two pair of my shoes were used when I got them. (One of those are my running shoes, the others are ones I got specifically for conference wear). Can you wear #5 shirt with white pants in #2? It seems that's what Emanuelle Alt is doing in pic #4. Does it half-tuck into jeans or is it still too short? How does it look tucked into the skirt? It does seem to be a good skirt length. I would love to see #5 but with the red booties, to add some interest. I am loving the camo 's ... and your hair! #1 and #2 are my favorites. I like the fading on the denim shirt, I'd keep it around for another season. And I agree about checking photos before heading out the door - amazing how sometimes things look different in pics than they do in the mirror! Ended up going a different route for my outfit tomorrow. Hopefully I can get better pics in the light. And here's another pic of the fading on that jean shirt. Still look current-ish? I like your take on the EA outfit--nice! The boots are good to go with some polish. All outfits are good here. #1 looks cozy and I like how you've lightened the camo look with cream--so fresh looking. The last outfit is very cool. The red booties add a nice bit of color. I see what you mean about the fading on the shirt. To me it looks a little odd, but honestly, I doubt I'd have noticed if you hadn't pointed it out. I'm also wondering if it's one of those things that is less apparent IRL than in the photo. Nice set of outfits. Your have done EA proud:) I actually prefer #5 over #6. For me #6 has just a little too much going on. I find #5 a very attractive outfit and the fading doesn't bother me at all. Lovely. The fading on the shirt doesn't bother me, but if it is bothering you, you could pop that V neck sweater in your latest pic #1 over it. Actually that could add another layer of interest to your outfit there, with the floral skirt.